A new bill was introduced in Parliament on Thursday, Feb. 28, that promises to address the large proportion of Indigenous children in Canada’s foster care system. The deadline is fast approaching for the National Inquiry into Missing and Murdered Indigenous Women and Girls Aftercare Support. There are species of rockfish found on British Columbia’s coast that are known to live for a century. For the first time ever, British Columbia's First Nations will be included in a share of the province’s gaming revenue. The announcement came Feb. 19 as part of the provincial government’s Budget 2019. Scientific uncertainty continues to cloud waters surrounding marine-based salmon farms despite a court decision that puts DFO on notice, essentially, to clean up its act. Contracts have been tendered for the next stage of constructing a 25-kilometre multi-use pathway in Pacific Rim National Park. After being named to the Order of Canada in 2018, Huu-ay-aht elder Marjorie White received recognition and honour at the Accreditation Ceremony in Quebec on Tuesday, Feb. 12. Ehattesaht member Ernie Smith is hoping to see his traditional Nuu-chah-nulth woven cedar hat again after it was stolen from his Campbell River art store. UPDATE: According to a media release dated Feb. 25 the Tofino RCMP are investigating a structure fire of a cabin in Warn Bay, near Tofino. Human remains were located in the cabin. To meet concerns over unregulated float homes in the region, the provincial government is taking over jurisdiction of two areas at the entrance to Barkley Sound. 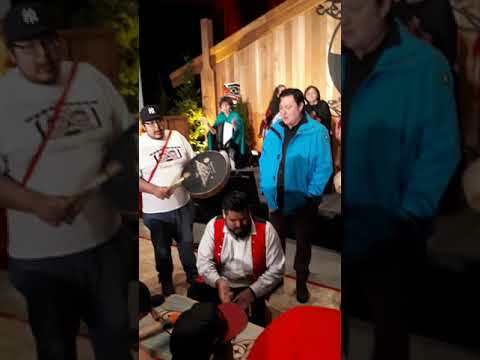 Several major projects are underway in Ahousaht that will not only improve the lives of the people living there, but also provide at least temporary employment for dozens of residents. The Alberni Community and Women’s Services Society is inviting the community to join them for the Coldest Night of the Year on Saturday, Feb. 23. A group of Nuu-chah-nulth youth have returned from a trip to New Zealand with a unique perspective of the country’s Indigenous Polynesian people.